Police investigated and worked to clear the scene where two men were involved in a car crash early Wednesday. One was transported to a hospital where he succumbed from his injuries. 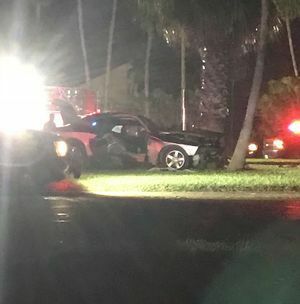 HARLINGEN — Two friends on an early morning cruise down Sunshine Strip 77 in a sports car had it end in a violent crash. A Dodge Challenger struck a light pole and traffic control device in the 1300-block of South Commerce. The vehicle had extensive damage and a 19-year-old male was found inside the vehicle critically injured. The teen was taken to a local hospital where he later died from his injuries. The accident happened at approximately 5:45 a.m. Wednesday. Harlingen Police Department responded to the one vehicle crash at the 1300 block of South Commerce St.
During the course of the investigation, the driver of the vehicle who police said had left the scene, was identified, and charges are pending. The Harlingen Highway Enforcement and Major Crimes Unit are still investigating this crash. The name of the victim is being withheld pending notification next of kin.